In addition to sewing buttons, I also worked on White Wedding. I managed to complete the left hand border. As part of the Stitch-a-thon on the Robin’s Nest, I hope to finish the top this weekend. I am beginning to see the light at the end of the tunnel with this piece and I will definitly have it finished in time for my mom to have it framed by Christmas. This evening, I worked on Butterfly Rest while watching Survivor. I made some progress, but not quite enough that anyone but me can tell. I actually think that this one is stitching up faster than when I did Butterfly Day (after getting through the stupid blue triangle of course). White Wedding looks fabulous. It’s so delicate and I love delicate :). Don’t cats just love to lie on their owners’ clothes? 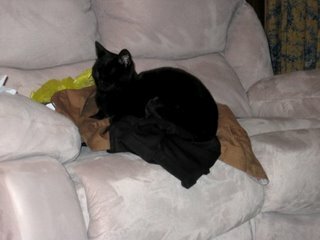 LOL Our Angus likes to sleep in Mike’s jeans (yes, in them!) and claws at his sneakers to sharpen his nails every chance he can get (Mike tends to kick them off and leave them on the floor in front of the sofa). We have pics somewhere of one of ours lying on DH’s trousers LOL! They always have to have something else (other than the chair/bed) to lie on – Thomas is the worst for this. Great progress on white wedding, it’s really coming along now! Aww, what a cute kitty! I just love your White Wedding, it’s so pretty and looks great in those colors. Cooper sure does look comfortable. Did he finally allow you to sew on the button? White wedding is coming along beautifully. 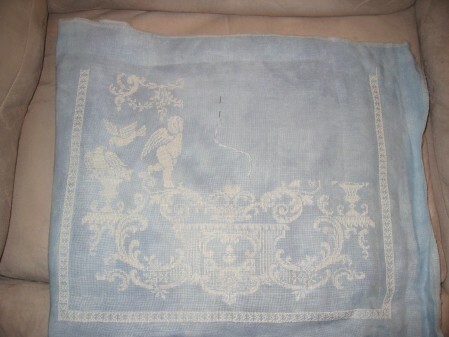 This whitework on light blue must require very good light to work on. White Wedding is so gorgeous. I can’t wait to see your weekend progress. I love your “Brotherly Love” and the Woodland Fairy is coming nicely.